Watched “Moneyball” Sunday night. I liked it. It surprised me. I wasn’t sure that it could be faithfully made into a film worth watching, but, as usual, I know little about the art of that. Brad Pitt is a great actor, all of the fluff of paparrazinsanity aside, and he hit a homer again. It’s an interesting story about baseball, change, and the resistance to new things that always comes. It doesn’t end with exploding lights, a la, “The Natural,” but with the gentle irony that success leads Billy Bean to a fateful choice between one vision of “success” and family–even though his is broken. I was in the mood to think about all of that, since my granddaughter just turned a year old this weekend. She has changed our lives and our priorities. I care much less about a great many things. I declined an opportunity to be part of a panel on religious responses to immigration law in Alabama, a topic I feel strongly about, but I’m going to see that little girl for a brief visit, and, as I explained to friends, this is even more important than securing the borders of the United States. Tony Giles, a friend who works in financial services, said yesterday that he is hopeful about the economy, even if worried, because, “Prosperity always climbs a wall of worry.” His idea is that as long as we are worried about our world, there is still a chance it can get better. I like that. Jesus told us not to be anxious, which is one of the strangest and hardest of all of his sayings, for what else motivates humans beyond anxiety? I know there is a way to not react to anxiety without eliminating it, and that is the best I can do. Don’t worry about my granddaughter? Might as well tell me to quit breathing. I will worry about, at, and just plain worry this world until it provides her the kind of planet little children deserve. If I had continued down midlife without her, I might have been able to unwind myself from caring a little more, retire, play golf and croak. But I can’t. It matters too much now. Thing is, I don’t mind minding so much. She’s worth it. If a smile can make a person feel that good, you can cruise on it all day long. The other day, our band, during practice, recorded “You Are My Sunshine” for my baby, recorded on an iPhone. (click to play it). 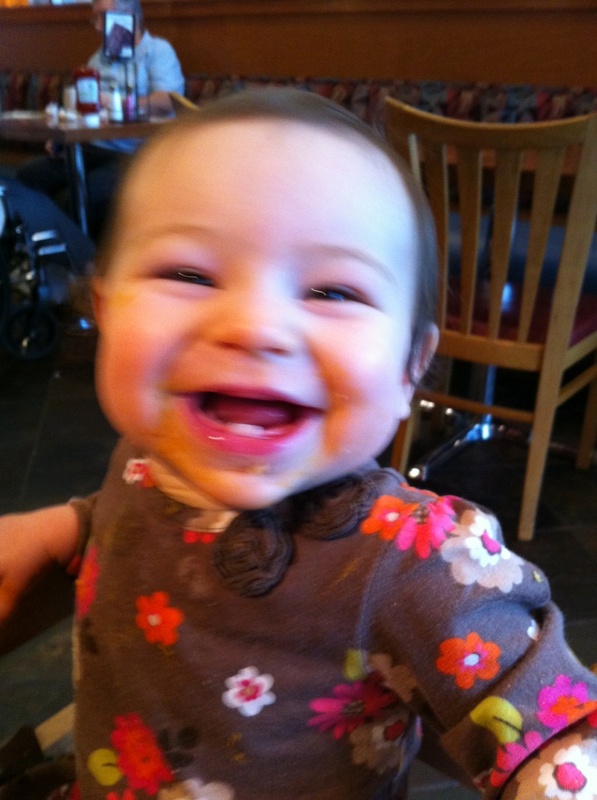 Grandparenting will make a fool out of you–I’ll testify. One that will keep caring, no matter how bad they say it is. God send us some more fools. We might balance some budgets, stop a lot of stupid wars, work harder, save more, and give our egos a rest. All you need is one baby. Posted on February 21, 2012, in Children, Ethics, Hope, Love, Music, Theology and Life and tagged anxiety, babies, Brad Pitt, caring, grandchildren, grandparenting, love, Moneyball, worry, You Are My Sunshine. Bookmark the permalink. 3 Comments. Anyone who says they can’t see God just needs to look into the face of that baby. It’s all right there. Everything we need to know. To answer your question about what motivates besides anxiety. Love. Spilling over from every word you wrote. And did you know that vicki and I love you too?